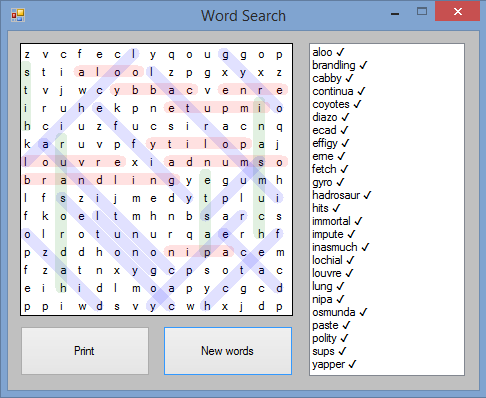 This is a WordSearch game, intended for playing either at your computer, or alternatively you can print it out and play in the traditional fashion with pen and paper. Each new game uses twenty five random words chosen from a 46K+ word list. Any single line (horizontal, vertical, or diagonal) in a letter grid may contain more than one word but no two words in a single line will overlap. Words may be as spelled in the listbox or reversed.
''' Each possible line has a line index. There are 76 distinct lines used.
''' Horizontal, vertical, and 2 * diagonal. Each Cell belongs to 4 lines.
''' in any of the 4 possible directions.
''' The Game class is the singleton core class initiated on app. load and used for the duration of app. running time.
''' This default constructor initializes the cells list containing the 225 Cells used throughout the game.
''' Also the 46K+ words used are read into the words array.
''' then random letters in the remaining empty cells.
''' No 2 words in the same line (horizontal, vertical, 2 * diagonal) will overlap.
''' Words on different lines can overlap. cells(r * 15 + c).text = ""
The letter grid used in this game is an extended DataGridView. This allows DoubleBuffering and restricting user selections, so mouse input can be used for highlighting words in any direction. Clicking on a cell, or tabbing the focus to the DataGridView doesn't show any visible focus. Holding the left mouse button down on the DataGridView and dragging to another cell causes a yellow rubber band highlighting line to be drawn. Releasing the mousebutton will change the color of the highlighting line, and make that a permanent line, if you have selected a valid line. If the letters you have highlighted form a word that is listed in the listbox, that item will be ticked in the listbox.
''' DoubleBuffered. Restricts user selection of cells to facilitate seamless highlighting line drawing. 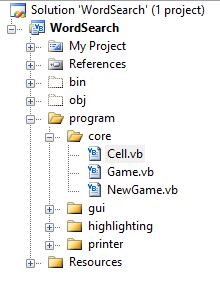 Writing a game in VB.Net is similar to writing any program in VB.Net, except where you need to be a little creative with the Controls you use. When designing your game, you need to look at which available Controls have behaviour that you could use. If those Controls have other behaviour that is not useful, or even a hindrance in your game, you need to work out ways to remove or modify that behaviour. This was a problem when designing this game. 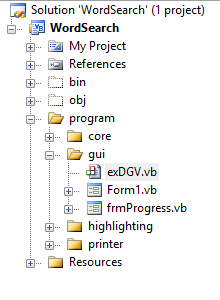 By default, the DataGridView responds to mouse input by highlighting a cell or a range of cells. This was a hindrance in this game. As well as being unsightly, it was dramatically reducing the drawing speed of the DataGridView which was making the game unresponsive. So the best tip for VB.Net game developers, but also applies to any VB.Net program developer, is to ask yourself: How can you use the available Controls?